Small businesses across the U.S. may be battling an array of problems from unemployment to a writhing manufacturing sector, but the craft beer industry in Portland, Ore., is, well, hopping. The Northwestern city, which often is compared to the beer-drinking capitals of Munich, Brussels and Prague, has 40 craft breweries within its limits and more than 50 in the metro area. That's more than any other city in the world, according to the Portland-based Oregon Brewers Guild, a business trade group. An adage says affordable luxuries such as lipstick and beer sell well in a sour economy, and that may be the reason for the city's headiness. From the start of 2011 through the end of June, small U.S. brewery sales surged to $3.8 billion, up 15 percent compared with the first half of 2010, according to the Brewers Association, a trade group in Boulder, Colo. But considering that overall beer sales were down 1.7 percent in the first half of this year, perhaps there's more to craft beer's rise? To examine the popularity of the craft beer business, we explored the nation's best-known hot spot for beer: Portland. The Portland region, which includes the lush Willamette Valley, has a bounty of natural resources. The climate is temperate, with cool, dry summers and mild, rainy winters. Though the city can seem gloomy at times, the area's farmland is fertile -- making the crops that brewers rely on to produce beer plentiful. And thanks to those rain showers, brewers also boast an ample supply of high-quality water. Lush farmlands near Portland offer plentiful ingredients like hops, barley and yeast for beer-making. What's more, Oregon produces about 17 percent of the nation's hops, or about 5 percent of the hops grown in the world, according to the Oregon Hop Commission, a Hubbard, Ore.-based group that represents growers in the state. Malted barley and yeast are also readily available, as are steel fabricators, which make the equipment used in beer production, says Alan Sprints, the owner of Portland's Hair of the Dog Brewing, a brewpub that produces between 500 and 600 barrels of beer a year. The city's proximity to those resources helps small brewers like Sprints manage production. "I can be much more flexible and decide what beer I'm going to be making depending on demand," he says. "If I had to order my ingredients months in advance, it would be much more difficult for me." The city also counts among its attributes a well-developed sense of tradition. Settled by German immigrants in the late 1800s, Portland quickly became a thriving beer town -- until Prohibition. Although that law, which banned the manufacture, sale and transportation of alcohol including beer, ended in 1933, local laws kept pressure on the craft brewery industry in Portland until the early 1980s. But when a 1983 ruling legalized brewpubs in the state, home-brewers crept out of their basements and set up shop. 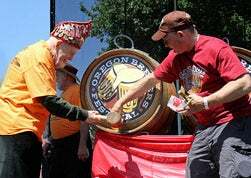 The Oregon Brewers Festival in 2011 attracted a record number of 80,000 attendees. In 1984, local winemakers Richard and Nancy Ponzi started up BridgePort Brewing, which is today Portland's oldest brewery. A year later, Mike and Brian McMenamin launched the first post-Prohibition brewpub in Portland, the Hillsdale Brewery & Public House. Today, their company has 24 brewpubs in Oregon and Washington. These brewery pioneers established a craft-beer market that’s not only lasted for generations but spawned legions of followers, says Paul Gatza, director of the Brewers Association. At the end of June, he says, there were 1,740 craft breweries in the U.S., an increase of 158 since June 2010. In 1980, there were just 80. Many of today's newer breweries were launched by former employees of the craft-brew pioneers, says Jason McAdam, the co-owner of Portland's Burnside Brewing, a 2,000-barrel-a-year brewpub. After seven years of working at two of the McMenamin brothers' brewpubs -- Oak Hills Brewpub in Portland and Edgefield in Troutdale, Ore., McAdam says, he had the skills to strike out on his own. "Through these guys, guys like me were learning the trade on the job, which led to us becoming small-brewery owners," he says. Today, Portland's beer scene has become downright frothy. While the number of beer tourists who frequent the city each year isn't known precisely, the area's local breweries are an undeniable draw, says Marcus Hibdon, a spokesman for Travel Portland, the city's travel bureau. Between festivals and pub tours, the summer months teem with tourists from near and far, he says. 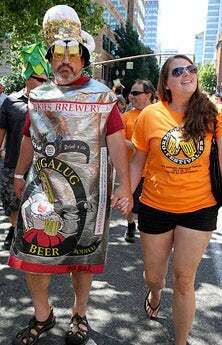 This year's Oregon Brewers Festival, held each July, drew a record 80,000 attendees, according to festival organizer, Chris Crabb. Last year, 78,000 people were in attendance. Attendees at the Oregon Brewers Festival, which takes place in Portland each July. While craft brewing in Portland is a big attraction for visitors, the locals make up the core of Portland's beer market, says Gary Geist, co-founder of Portland-based Lucky Labrador Brewing, which is set to produce 26,000 barrels of beer this year. "Our customers here in Portland are proud of the beer that is produced here. They're also willing to try new styles, and they have a more trained palate to know what good beer is," he says. Despite its robust craft-brew industry, Oregon's overall economy isn't so healthy. The state's unemployment rate, at 9.6 percent in August, remains one of the highest in the U.S. The nation's unemployment rate in August was 9.1 percent. 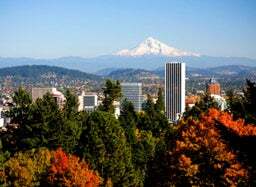 "Portland always goes down further and faster than other parts of the country," says Charles Heying, an associate professor of urban studies and planning at Portland State University. "Economists say that it's because we have industries that are hurt from the recession more," he says, noting that area is full of mom-and-pop shops and consumer-products companies. Heying adds that Portland also tends to attract a lot of younger people who may be first in line to lose their jobs when businesses stumble. Still, local residents continue to spend on little luxuries, says Heying. "Portlanders are willing to drive an old beat-up Toyota as long as they can get a good cup of coffee," he says. "They're into spending money on things that are life enhancing rather than status enhancing." It helps that the area's cost of living is modest and low-cost public transportation options are comprehensive, says Heying, who studied Portland's artisanal culture in his book Brew to Bikes: Portland's Artisan Economy (Ooligan Press, 2010). Such enthusiasm tends to also aid burgeoning breweries, even amid the city's already stiff competition. The owners of Migration Brewing considered whether Portland's residents could handle yet another brewpub before they opened last year. But their concerns quickly evaporated. "Portland is a destination spot right now," says McKean Banzer-Lausberg, co-owner of Migration, which is set to make 900 barrels of beer this year. From 1990 to 2010, the population within the Portland metro area grew 40 percent, adding 512,000 residents, according to the Oregon Employment Department's reading of U.S. Census data. To date, more than 583,000 reside in the city of Portland and 2.2 million live in the metro area. Further, Banzer-Lausberg adds, that he and his partners didn't have to worry about introducing a whole new concept to Portlanders. "The way I look at it, the infrastructure is developed. People are already exposed to the product, and there's a palate here for good beer," he says.